17 soft, cuddly and adorable teddy bear companions to make and treasure. Renown teddy bear creator and enthusiast, Monika Schleich, shares her expert techniques for sewing these huggable bears. Choose from vintage style teddy bears, polar bears, baby bears, pandas and plenty more soft-paw companions! 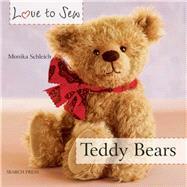 Monika Schleich: Monika Schleich has turned her love for Teddy-Bears from a hobby into a lucrative career. She sells her own home-made collectable bears for "adoption" as well as supporting community college courses and writing for the prestigious German journal Teddy & Co. where she has twice been awarded 1st place for Best Teddy-Bear designer. This is her first book with Search Press.